We actually prepare your state and IRS applications and file for you. Forming a nonprofit is complex. Harbor Compliance makes it easy. Fast-track your organization’s success with our proven nonprofit formation services. Your Nonprofit Compliance Specialist manages the entire process, eliminating hours spent researching and preparing state and IRS applications. You simply review and sign the documents your Specialist prepares. We handle the rest! 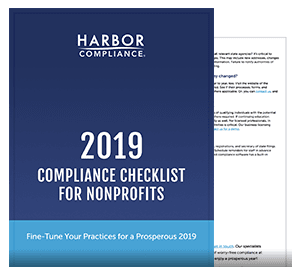 Harbor Compliance had our 501(c)(3) determination letter in our hands eight calendar days before your competitor had scheduled our initial consultation ... To say Harbor Compliance is impressive is an understatement. Everyone there has been helpful, kind, courteous, and without any impatience. Everything done on time, as stated. Dr. Bob A. Reform It Now, Inc.
Work closely with your Nonprofit Compliance Specialist every step of the way. Your Specialist is available to answer your questions and provide responsive support to your organization. Your Specialist prepares and files each government application for you and keeps you informed throughout the entire process. No matter what stage you’re in, we can help! We can set up your organization from scratch, apply for tax exemption if you’ve already incorporated, or get your tax exemption back if you’ve been revoked by the IRS. Our Nonprofit Compliance Specialists are the best in the business. They have decades of experience leading nonprofits and managing compliance. Your Specialist will have the expertise to help you every step of the way. As a seasoned nonprofit leader, your Specialist will have a wealth of practical knowledge about launching and developing a successful nonprofit. Think it’s too good to be true? Just look to our 100% application success rate and outstanding client outcomes as proof. When you get started with us, you’ll be introduced to your Specialist within one business day. While other companies take days or even weeks to staff your project, we take minutes. The number one reason for slow processing times are incorrect and incomplete applications. We get it right the first time to maximize the likelihood of outright approval. We have offices nationwide for in person filing with the states to receive the fastest processing available. We make these full expedite options available to you. Your Nonprofit Compliance Specialist carefully reviews your mission and prepares your 501(c)(3) application to ensure approval. We know exactly what the IRS requires and will submit a complete application that meets those standards. We maximize the chance for outright approval, but will prepare responses in the event that the IRS examiner requires additional information. 100% of our applications have been approved so we can confidently guarantee that you too will receive your 501(c)(3) approval. We will introduce you to your Nonprofit Compliance Specialist within one business day for an initial conversation. Your Specialist will carefully understand your mission and planned operations, answer your initial questions, and outline a road map for establishing your nonprofit. Your Specialist will prepare and file your articles of incorporation, create your nonprofit bylaws, and efficiently complete each additional step necessary to successfully obtain your 501(c)(3) approval. If you have already completed any of these steps, your Specialist will review your work in detail and make any necessary changes. Beyond your guaranteed 501(c)(3) approval, our Compliance Package provides our most complete support. At the same time as preparing your 501(c)(3) application, your Specialist will provide seamless assistance with additional registrations required in your state of incorporation. Your Specialist will manage your annual reports to the secretary of state, fundraising registration with the charities bureau, and other filings as necessary to keep your nonprofit in good standing. In addition to full service management of your filings, your Nonprofit Compliance Specialist will provide support as you grow your organization. Our Compliance Package allows you to focus on your mission and achieve maximum impact for your cause. We verify that the name you have in mind is legally available in your state. Your Specialist will complete your articles of incorporation for you to review and file with the state. We’ll create bylaws to govern the board of directors of your nonprofit. These are customized to your group and include specific provisions required by the IRS. Your Specialist will create a conflict of interest policy which applies to your board of directors. This policy is required by the IRS when applying for 501(c)(3) status. We obtain a new Federal Employer Identification Number (EIN) from the IRS for your organization. An EIN is like a Social Security Number and is used for opening a bank account, hiring employees, and paying taxes. We prepare and file your EIN application. Your Specialist will complete your application in its entirety and identify all required schedules, attachments, and supporting information. We will complete any necessary follow up work with the IRS until your 501(c)(3) status is successfully granted for your group. Appointing a registered agent is required when you incorporate your organization. The agent will serve as a point of contact for the Secretary of State office and as a point of delivery for service of process should your organization have a lawsuit filed against it. Registered agent is billed at $99 per year. We will prepare and submit your registration with the state to become licensed to solicit donations. This registration must be renewed, typically annually. The Compliance Package includes fundraising registration in the state of incorporation. Some states require an initial report be filed following the incorporation of your organization. We will prepare and submit this filing. Some states also require you to publish notice of your incorporation in newspapers of general circulation. Once the ads have run for the required amount of time, you’ll need to provide proof to the state in the form of an affidavit. We have systems in place to manage these requirements for you and will follow up with the state to make sure you’re in compliance. We will file your annual report in your state of incorporation so that your nonprofit remains in good standing. Your Specialist will conduct a detailed review of your nonprofit records, operations, and growth plans to identify additional compliance initiatives and provide support as you grow. Our Compliance Package allows you to access your Nonprofit Compliance Specialist even after you’ve gained tax exemption. This piece is invaluable for new organizations that may run into challenges as they grow. Our nonprofit resources make it easy to ensure that you’ve covered all the regulatory bases. For more resources, make sure to visit our Information Center! Make sure you’ve covered all the bases with our simple 13-point checklist for nonprofits. Sign up to learn the basics of starting a 501(c)(3) nonprofit. What makes Harbor Compliance different? Unlike many online companies, we actually prepare your documents for you. With us, you won’t need to bother with time-consuming online questionnaires or drafting the documents yourself. We pair you with a specialist. A real person! Your specialist discusses your mission with you and collects the basic information needed to get started. From there, your specialist actually prepares your documents and sends them to you for you to review. Take advantage of their wealth of experience setting up all types of nonprofits! When you choose your formation package and sign up online, you can expect to hear from your specialist within one business day to schedule your initial discussion. We offer two packages, Tax Exempt and Compliance. Please complete the Get Started form above to tell us more about your nonprofit and get a quote. As little as two weeks! From the moment you sign up, you can receive your 501(c)(3) determination letter in as little as two weeks. The IRS processing time on the high end is currently up to 3 months on average. This is a huge improvement from 6 to 12 month processing last year. Processing times can change at any time so take advantage while it lasts! Many of our competitors make you wait weeks for an initial consultation. We think that's terrible service. We get to work right away. Your specialist will reach out within one business day. Do you actually prepare my documents and applications? Yes we do! We ask for a little bit of information from you online, such as your nonprofit's name, your state of incorporation, and your contact information. Your nonprofit specialist reviews that information and discusses with you the details. Your specialist prepares all your forms for you and sends you drafts to review before filing. I have already incorporated my nonprofit. What now? Terrific! Many of our clients have existing entities. As part of the same package, we review your existing paperwork, and amend as necessary so that it will meet IRS approval. Do I need an SSN or ITIN for this process? No, it is possible to file with the IRS without an SSN or ITIN, but it is much easier if you do have one. If you or one of your board members has an SSN, it makes obtaining an EIN much faster. If you do not have an SSN, please expect longer state and IRS processing times. Can you work with my attorney or accountant? Absolutely. As document filing specialists, our service complements, not substitutes, the counsel of your attorney or accountant. We do not provide legal or tax advice and will let you know if we come across an area requiring legal or tax counsel. We work with clients who are in a variety of stages of planning. To get started, we need you to complete the initial information in our brief online questionnaire. This includes your nonprofit's name, your contact information, and your state. Your specialist carefully reviews this information and reaches out to you to discuss in further detail. None of the information you put in is final, so don’t worry if you’re not 100% sure of an answer. If you have questions about our service, please call 1-888-995-5895 to speak with a sales representative. Or call 1-888-995-5895 to speak with an Account Manager. We look forward to helping you launch your organization!